The major difference between a chrysalis and a cocoon is that a chrysalis is the hardened body of a butterfly pupa, whereas a cocoon is an external structure constructed by larvae to protect themselves during the pupal stage. While there are many different types of insects that create cocoons, they are largely associated with moths. Butterfly caterpillars, with very few exceptions, do not build cocoons, but instead harden into chrysali during their pupal stage. Butterflies and moths both belong to the order lepidoptera, which translates to “scaled wings.” This order includes around 265,000 different species. Out of these, butterflies comprise about 20,000. Although butterflies and moths share many similarities, there are a few key differences. One is in the antennae -- butterflies have club-shaped antennae, whereas moth antennae are feathered or tapered. Butterflies are generally diurnal insects, while moths tend to be nocturnal. Butterflies tend to be more colorful and elaborately patterned than moths, where moths have thicker scales that sometimes give them a fuzzy or furry appearance. Of course, another major difference is that butterfly larvae form chrysali during their final transformation stage, while moth larvae build cocoons. Although they have several differences, butterflies and moths go through the same life stages. The adult female lays eggs, which hatch into caterpillars. As caterpillars grow, they molt and shed their skin four to six times before transforming into pupae. The pupa is the final stage of development, during which metamorphosis takes place over a period of about two weeks, at the end of which an adult butterfly or moth emerges. The chrysalis is the pupal stage of butterfly development. Just before its final molt, a butterfly caterpillar spins a small disk of silk to attach itself to the underside of a leaf or twig. The caterpillar sheds its skin one last time as the pupa emerges. The outer surface of the pupa hardens into a protective shell, which often takes on a color and shape to help blend it into its surroundings. Moth pupae don’t harden like butterfly pupae do, so to protect themselves during this final transformative stage, moth caterpillars spin cocoons of silk around themselves before the final molt. This silk hardens into a protective casing, allowing the pupa to go through metamorphosis relatively undisturbed. Some moth caterpillars, such as silkworms, spin cocoons entirely from silk, while others incorporate leaves, plant matter and even hair from their own bodies into the cocoons. 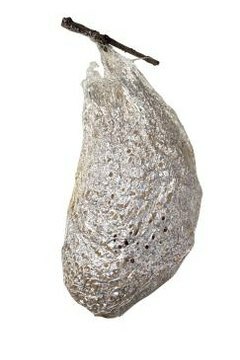 Moths are not the only insects that build cocoons. Ants, fleas and wasps are a few of the other insect species whose development includes a pupal stage that must be protected by a cocoon.